Nigeria’s First Lady Aisha Buhari has been spotted in the United States as she arrived the country on a visit carrying a Hermes Birkin 35cm Porosus Crocodile Gold Hardware Bag worth $105, 000 (N40, 950,000) at $1 to N390 current conversion rate. 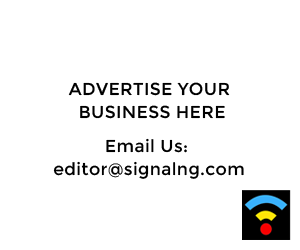 A tweet by SIGNAL on Thursday morning first disclosed the details to Nigerians, causing great stir and controversy on Nigeria’s social media space. 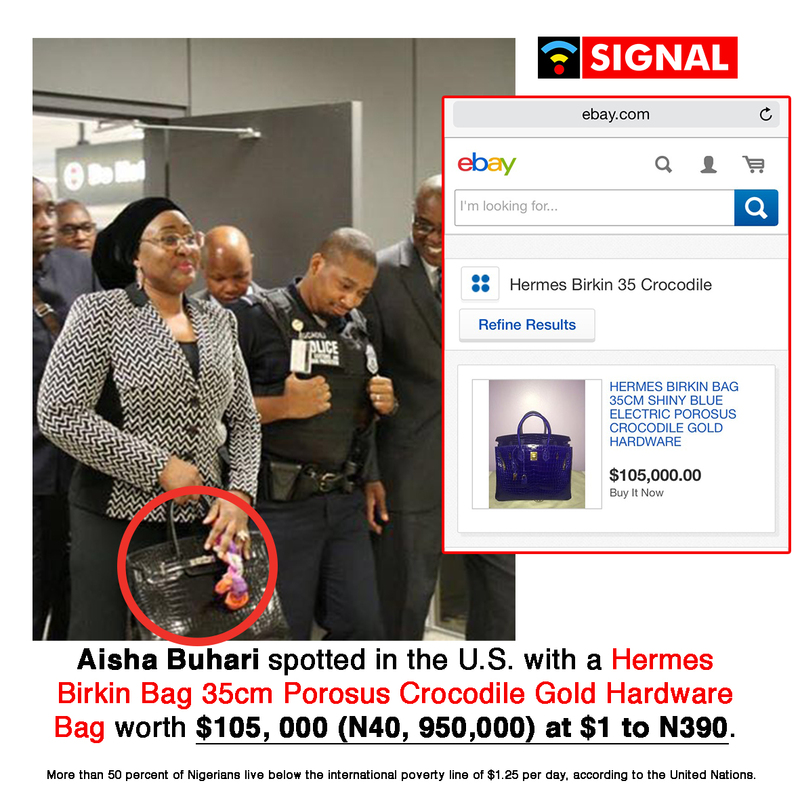 Further checks by SIGNAL on Thursday revealed that the exact pink version of Aisha Buhari’s Hermes handbag was auctioned in 2015 for $222,912 (N86, 935, 680) at a Christie’s auction in Hong Kong. Recall that in March 2015, Buhari was elected as Nigeria’s new president after a campaign premised on a strong anti-corruption narrative. Buhari played up his humble credentials by raising money from ordinary voters. He was even said to have borrowed to buy his presidential nomination form on the platform of the All Progressives Congress (APC). Buhari’s frugal, austere, man of the people image was first diluted when his wife, Aisha, was pictured wearing an expensive-looking watch at her husband’s inauguration in May 2015. The wristwatch, a Cartier Baignoire Folle 18-carat white gold diamond timepiece was estimated to have cost around $50,000 – more than £30,000 or about 17 million Nigerian naira. Report of the development sparked public outrage, making international news headlines. As has become the usual reaction in the Nigerian social media, commentaries on Aisha Buhari’s shockingly expensive handbag have been sharply divided with many Nigerians questioning the source of the handbag in the face of stern economic recession. Many of them hinge their arguments on the notion that Nigerians were fooled into believing that the Buharis were poor and rode on that sentiment to get elected. Meanwhile, President Buhari’s social media supporters insist that Aisha Buhari is a wealthy woman and can buy anything she likes. Reports indicate that more than 50 percent of Nigerians live below the international poverty line of $1.25 per day, according to the United Nations. Just last week, Nigeria’s Finance Minister Kemi Adeosun officially announced that Nigeria was in economic recession. She broke the depressing news to Senators in plenary while briefing them on measures adopted to get the economy out of the woods. Before now, she wore a multi-million naira Cartier wrist watch to her husband’s inauguaration on 29th May 2015 and APC propaganda machine came out with a story on how the watch is fake, now this?!!! So, much for poor Buhari that could afford the money for his presidential race nomination form and had to take a bank loan to buy the same form his party (APC) said friends teamed up to purchase the form for poor Buhari?!!! Anti corruption war my foot! Your Boss Koro is still avoiding justice you are here publishing what you don’t know. I wish you will help us investigate how you shipped those monies from Lagos enroute to Ekiti. You benefitted from Koro cos he was paying you from our loots. Interesting, but I wonder which airport this picture was taken in America. An international airport in the US that has only black people around who seem so interested in a nonentity like Aisha Buhari, would definitely confirm the height of racism in America.